Woe unto thee, Chorazin! Woe unto thee, Bethsaida! For if the mighty works, which were done in you, had been done in Tyre and Sidon, they would have repented long ago in sackcloth and ashes. But I say unto you, It shall be more tolerable for Tyre and Sidon at the day of judgment, than for you. . . that it will be more tolerable for the land of Sodom in the day of judgment, than for thee. 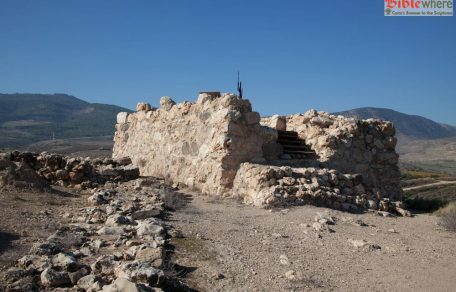 The Jewish settlement of Korazim was, indeed, destroyed in the 4th century AD. Eusebius writes about a “Galilean village that was cursed by Christ, accord-ing to the Apostles. 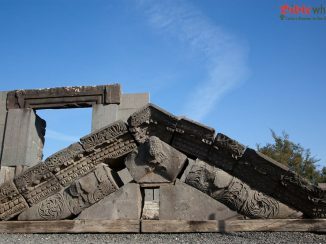 Today, it is in ruins.” Much later, the location became a Bedouin village centered around a sacred grave and was known as Karazeh. 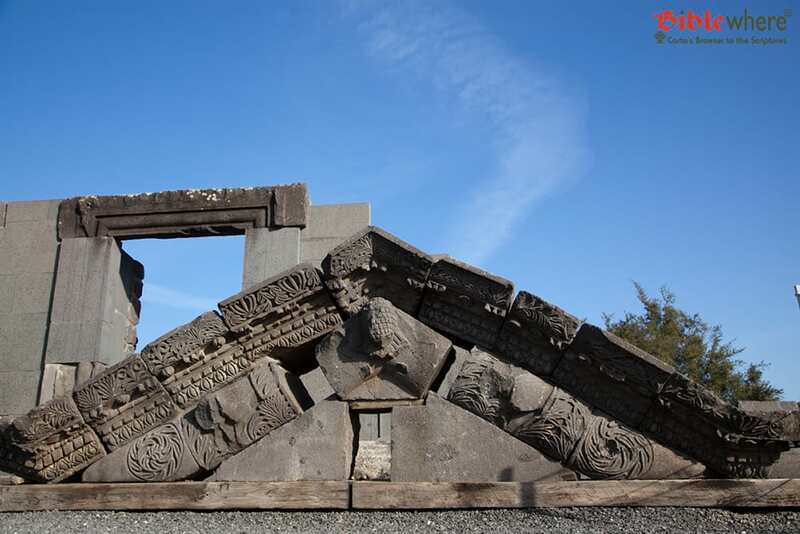 At Korazim, there are partial remains of buildings and other facilities from the ancient city. 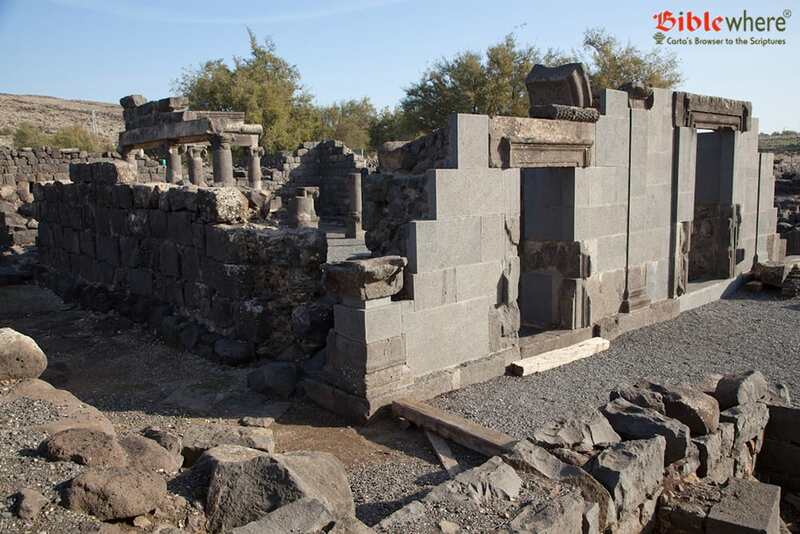 The feature find at Korazim is the ruins of a magnificent synagogue, built entirely of black basalt stones. Anyone who has worked with basalt knows how hard this rock is and how difficult it is to work decoratively with it. Sculpting it leaves little room for repairs and patchwork; a shard shaved off in the wrong place or cut inaccurately, and the entire stone is ruined. Here one finds delicate and exact ornamentation that only the most highly skilled artists can craft. 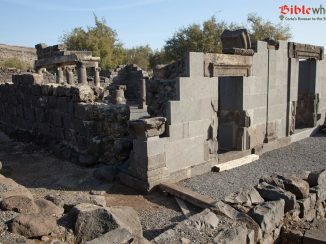 This artistry is quite evident when comparing this synagogue with the one found at Capernaum a little more than 2 km to the south. 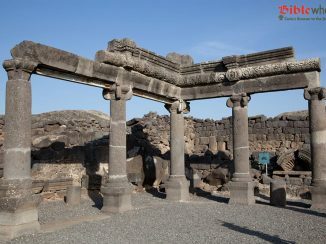 Indeed, when one sees the stones of the destroyed Korazim synagogue scattered around the site, it is possible to discern how rich and refined is the artistry that went into it. This is clearly discernible in the partial restoration of the synagogue in which some elements were restored in situ. The architectural style of the synagogue is similar to the other stone-built synagogues in the Galilee: its splendidly-ornamented façade faces south and it has three entrances; the main central entrance flanked by two, smaller ones on either side. Because the synagogue is built at the top of a slope and the base of its frontal wall is high, a wide flight of steps was built to ascend to the entrances. 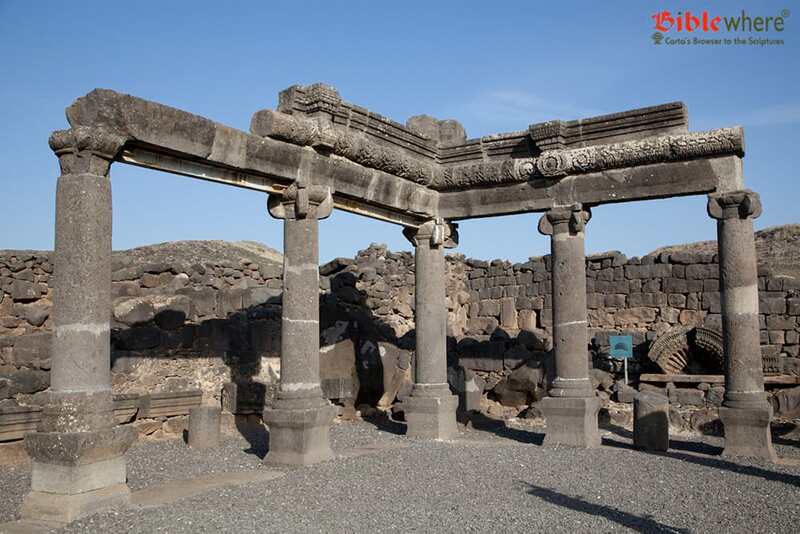 That ornamentation which has remained intact gives this synagogue an appearance of being more richly constructed than others but this might perhaps be attributed to the durability of the basalt rock construction which is less subject to erosion than the limestone found elsewhere. In the restoration work, a large triangular gable made of sand-stone and meticulously decorated was erected. Other hewn basalt remains include the so-called “Seat (Cathedra) of Moses” bearing the inscription: “Remember with favor Judan, son of Ishmael, who constructed this pillared room and the stairway, whose reward will be with the righteous.” Large conches, executed with great exactitude and which rested on the friezes, were also found. Other objects of interest include statues of lions and zodiac signs. In the course of restoration work on the synagogue, other parts of the city were exposed including streets, parts of houses, and facilities such as a ritual bath and an olive press. And thus another ancient Jewish city has emerged from the ruins. The name for the town of Rosh Pina is derived from the Bible: “The stone which the builders rejected has become the ‘chief cornerstone’ [rosh pina]” (Ps 118:22). In its first life, this settlement, founded in 1875 on land which belonged to the Arab village of Ja’uni, was called Guy Oni. Following economic difficulties and drought, the inhabitants abandoned the settlement and returned to Safed. In 1882, an association of Jewish pioneers from Romania, joined by several families from Russia, purchased the land where the failed settlement once stood. 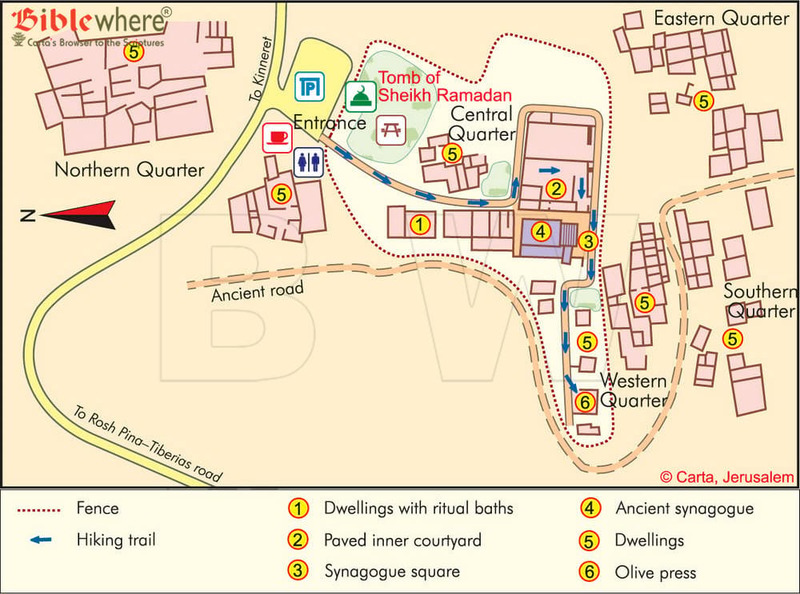 Because the Turkish Sultan did not permit the building of new houses, the settlers resided in Arab houses in Ja’uni. After initial hardships, the settlement received the support of Baron de Rothschild. He built a silk factory, but the Baron’s administrators treated the settlers as inferior, which distanced the settlers from their benefactor. Commencing in the 1970s, artists and self-employed pro-fessionals began making their homes in Rosh Pina. With the help of Israel’s Nature Preservation Society and other conservationists, old houses were restored and opened to the public at large. 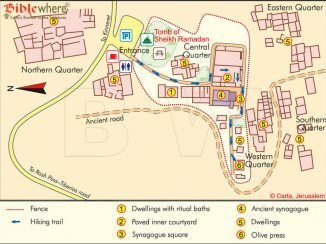 Among the reconstructions that are now tourist attractions are an ancient olive press from Roman times, PICA House—the administrative center for Baron de Rothschild’s settlement scheme, the commu-nity center, and the first synagogue. In addition, there are art galleries, artisan studios, a music shop (Song of the Tree), restaurants and cafes. 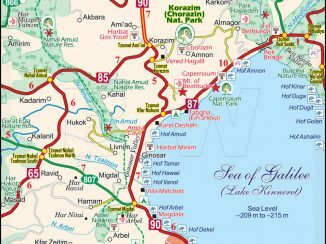 This is a holiday resort in the Upper Galilee which caters to those who are interested in seeing the countryside on horseback. Some residents are engaged in breeding horses. Facilities include a guest house, restaurant, and parking lot. 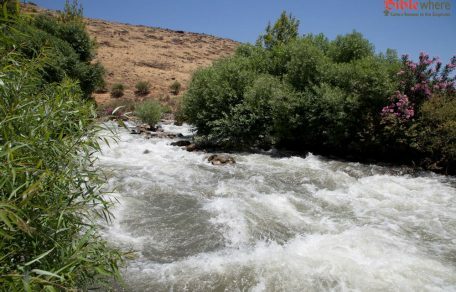 These hot springs, known in antiquity for their remedial cures, are located about 2 km south of Tiberias. The Ernest Lehman Museum at the Park’s entrance exhibits the history of these springs. The mosaic floor of a 4th century synagogue is on display in an outdoor area of the Park. The tomb is inside the white-domed building situated beside the hot springs. Every year on the 14th of Iyar, there is a public celebration in memory of the saintly rabbi. This tomb is situated in the lower city. Maimonides died in Egypt in 1206 and was buried in Tiberias. Beside his grave are the tombs of Rabbi Yohanan ben Zakkai, Rabbi Eliezer, and other sages. This cluster of tombs is a pilgrimage site. The old city walls of Tiberias have long been a landmark of this town. Some segments were built by Dhahir el-Omar in 1738, and other parts of the wall were repaired in the 19th century. The most impressive remnant is the northern fortress which has been almost completely preserved. 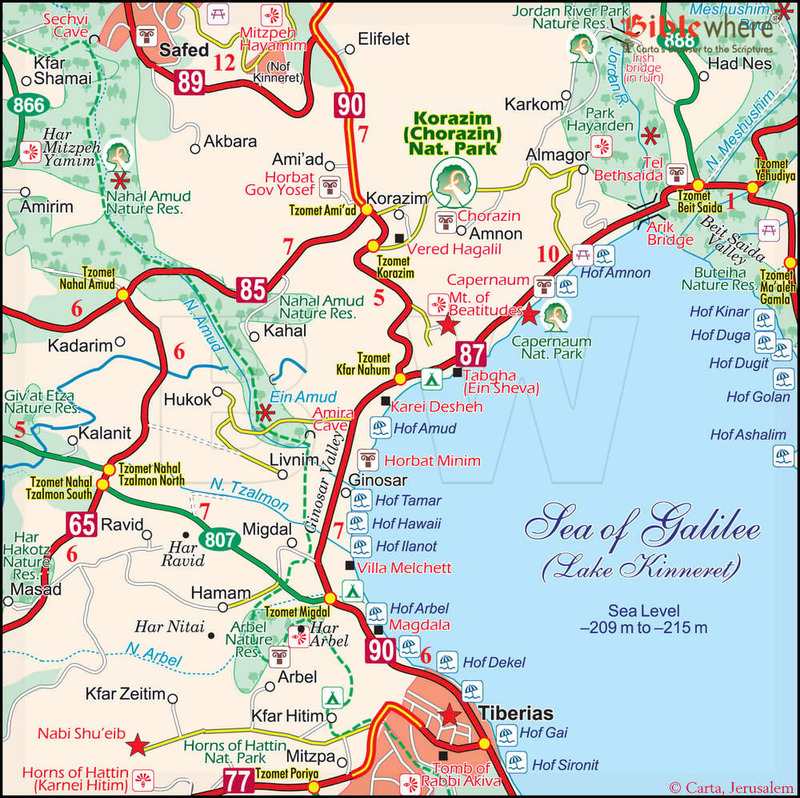 This follows the shore of the Sea of Galilee and is dotted with cafes, restaurants, hotels, and a marina. There are a number of wharfs from which to take boat cruises on the lake or to different destinations around the lake.